A therapist draws on Lord Krsna's teachings to help a child control his rage. THE HOSPITAL ROOM SMELLS strongly of antiseptic as I walk in. Chris sits on his bed, immersed in rapidly pushing buttons with his thumbs. "Nintendo?" I ask nonchalantly, breaking his concentration. "Play Station," he replies, continuing to madly push buttons. I sit in a chair next to his bed, observing his strategy for blowing things up. After a couple of minutes, Chris slams the game paddle to the floor. "I hate this game," he snarls, with a few expletives thrown in. Instinctively I reply, "Hmm, sounds like you're really angry." My statement of the obvious sounds ludicrous to both of us. Chris ignores me. He covers his head with the bed sheet and mumbles to himself. I feel uncomfortable and don't know what to say to draw him out. Chris is an eleven-year-old boy I've been working with in mental-health therapy for the past year. He has a history of explosive, raging outbursts. Recently he kicked a brick wall so hard he broke the femur in his right leg. Now he's confined to a hospital bed with pins in his leg. I make another feeble attempt to connect to him. "Anger is a powerful feeling. Looks like we need to explore new ways for you to control it, rather than it control you." After enduring a few more minutes of silence, I decide to try a different approach.
" I brought you some cookies," I say with as much enthusiasm as I can muster. At this, he peers out from under the sheet and asks, "What kind?" Relieved to hear some response, I reply "Peanut butter." He puts his hand out, and I place the cookies in it. Both he and the cookies disappear under the sheet. The muted sound of his munching fills the sterile room. Since Chris and I began working on his anger, he has learned to identify things that trigger it. Getting teased at school makes him furious and inspired him to kick the brick wall. He has also learned to recognize that when he loses control, his fists and teeth clench and he feels flushed. He has developed a repertoire of positive ways to deal with his anger: walking away, positive self-talk, running around the block, visualizing a peaceful place. Despite this arsenal of anger-management skills, he still fails to control his anger in real-life situations. Because I'm a long-time student of Bhagavad-gita, Chris's problem reminds me of the verse in which Lord Krsna tells His friend and disciple Arjuna that anger comes from lust. People generally think of lust as sexual longing. But Lord Krsna's definition of lust extends to any ungodly desire to gratify the senses. Lord Krsna further explains that although the senses require a certain amount of satisfaction, unless regulated they become like wild horses, forcing one to obey their whims. Craving the objects of their satisfaction, the senses take control of the mind and intelligence, leading to frustration and anger when their impossible demands go unmet. From this anger, Krsna continues, delusion arises, and from delusion, bewilderment of memory. When memory is bewildered, human intelligence is lost, leaving one in a hell of irrational behavior. Modern society is full of people plagued with sensual addictions. When such people can't satisfy their urges, they become frustrated and anger takes control. As a result, we are currently witnessing unprecedented acts of violence throughout society. Even our middle-class suburban schools have been victimized by a rash of killings perpetrated by children from their own communities. On April 20,1999, two students of Columbine High School in affluent Littleton, Colorado, opened fire on their fellow students, killing eleven and injuring many more. For the climax of their orchestrated massacre, the boys shot and killed themselves. Like my client Chris, the Littleton boys had experienced peer rejection. One of them had graduated from an anger-management class. Still, rather than seek out ways to be accepted, they chose to retaliate with vengeance. They identified with hate groups and then planned a diabolical scheme to persecute those they imagined had smitten them. This is a modern illustration of the Gita's timeless words: a thwarted desire for adoration and distinction emotionally evolves from lust to anger, then to delusion, and finally to insanity. Graduates of the study of the Bhagavad-gita go on to the Srimad-Bhagavatam. The Bhagavatam narrates several accounts of how anger bewildered the intelligence of even great personalities. Once Durvasa Muni, a powerful yogi, approached the palace of Ambarisa Maharaja, a saintly king and exalted devotee of the Lord. Ambarisa prepared a reception with sumptuous food for Durvasa. As was the custom, before accepting his meal Durvasa went to bathe in the river. While bathing, the mystic Durvasa entered a yogic trance and stayed in the water for some time. King Ambarisa had been observing a religious fast, and the proper time to break his fast was approaching. Not wanting to offend Durvasa by accepting his own meal before feeding his guest, Ambarisa Maharaja drank a little water an action that simultaneously breaks and does not break one's fast. By his yogic abilities, Durvasa came to know of this perceived transgression. Thinking the king's action disrespectful, Durvasa became insulted, and to retaliate he went before Ambarisa with angry words. He then invoked a fiery demon meant to destroy the king. But Lord Krsna protected His devotee Ambarisa and released His razor-sharp disc weapon towards Durvasa. 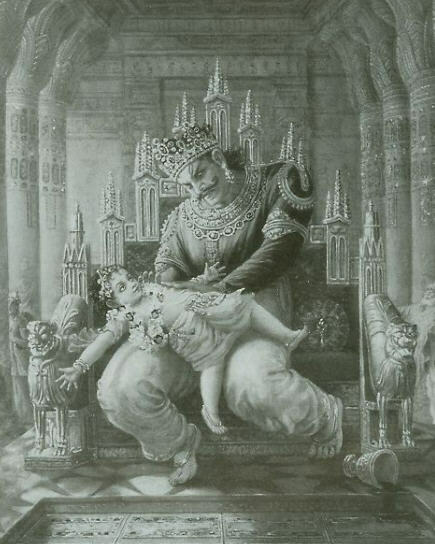 After fleeing for his life, Durvasa came to his senses and realized how his pride and lust for adoration and distinction had provoked his needless wrath. Understanding the ramifications of his anger, Durvasa Muni fell at the feet of Maharaja Ambarisa and received forgiveness. There are rare instances where anger is spiritually appropriate, provoked by injustices against the Lord and His devotees. Most anger, however, is a negative emotion manifested from frustrated attempts to enjoy sensually in the material world. Such anger must be checked and controlled. Teaching people anger-management skills can help. Chris sometimes successfully avoided confrontation by remembering to use them. But as fever is a symptom of some disease in the body, anger is a symptom of ongoing material hankerings. Just as treating fever alone will not cure the disease, treating anger without understanding it to be a symptom of lust will not extinguish the unwanted behavior. To conquer anger, we must first ask how we shall conquer lust. The Srimad-Bhagavatam describes many persons who conquered lust and were unaffected by anger. Foremost among them is Prahlada Maharaja. At the age of five, Prahlada, a selfrealized devotee, had no interest in worldly gain just the opposite of his lusty, atheistic father, Hiranyakasipu. In time, the godless Hiranyakasipu began to look upon his saintly son as an enemy and plotted to kill him. Although harassed in various ways by his father, Prahlada never became angry with him. The Lord, however, appeared as Nrsimhadeva and killed Hiranyakasipu. Afterwards, He offered a benediction to Prahlada, who, being self-satisfied in love of God, asked only that his evil father be liberated from his sins. To be free of any negative emotions towards a person who tries to kill you may seem impossible. Yet a pure soul sees things differently. Pure devotees of God know they are spiritual beings, separate from the material body, and they see others in the same way. They understand how karma forces everyone to act according to a particular conditioned nature. They have full faith that the Lord is orchestrating everything and that He will protect them. Self-realized souls such as Prahlada are satisfied, so they don't need to exploit anything or anyone. While this portrait of a pure soul may seem foreign, it is nevertheless our actual nature. Layers of dirt may cover gold, but when thoroughly cleansed the gold resumes its brilliance. Similarly, those who become cleansed of material desire again exhibit their original purity. Such purification is possible by engaging the demanding senses in serving the Lord. Without using the senses in God's service, trying to control them will end in frustration and failure. I realize that Chris's success hinges on his turning to God, Krsna. Chris can now go in a direction that will elevate or degrade his consciousness. He can allow his anger to consume him and follow the teenage murderers of Columbine. Or he can follow in the footsteps of Prahlada and Ambarisa. Right now I can't imagine Chris sitting down to chant the Hare Krsna mantra on beads. But I can introduce prayer to get him started. When Chris finally emerges from under the sheets, I suggest a new tactic: praying to God for help with his anger. Together we formulate the prayer: "My dear Lord, please help me to stay in control of my anger. Help me to be calm and peaceful even when I'm being teased." Chris repeats the prayer several times out loud and gives me an approving nod. "Maybe this will help." he says with a new confidence. "I'm sure it will," I respond, getting up to leave. "Come again," he says, "and bring more cookies!" I make a mental note to bring cookies offered to Krsna so Chris can be purified. I'd hate for him to be angry with me. Arcana-siddhi Devi Dasi was initiated by Srila Prabhupada in 1976. She lives with her husband and son in Baltimore, Maryland, where she works as a family therapist.